BERNARDO is trying so hard to remain positive, but shelter life has taken its toll on her emotionally. 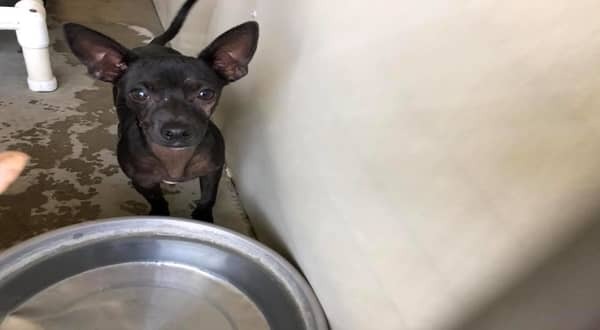 The once happy go lucky pup, who just a few weeks ago was living a good life, was mercilessly surrendered to the San Bernardino City Shelter. Today, BERNARDO, an intelligent, high energy 8 month old Chi mix is reduced to a hurting and weeping soul, pondering what could be a dark future. Instead of playing out on a field, enjoying all the treats he could handle, he makes a cold concrete slab the only solace from the tears that stream down his face. 2 Responses to "Forgotten 8 months old black Chi routinely pass for adoption, begging to be saved from deadly shelter"
"We adopted our little old girl here!!! super nice!!!" "This organization takes senior dogs and fosters them while looking ..."